Connect your USB 3.0 devices, with this high-quality USB 3.0 certified cable. The USB3CAB2M 2-meter USB 3.0 A-to-B cable provides a high quality connection between peripheral devices that feature a USB 3.0 type-B port, such as hard drive enclosures, card readers, docking stations and video capture devices and a USB-capable computer.This cable is USB-IF certified to USB 3.0 specifications, guaranteeing a dependable, long-lasting connection to your USB 'B' devices. 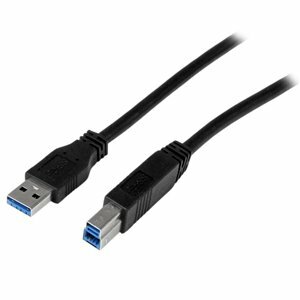 The USB3CAB2M 2-meter USB 3.0 A-to-B cable provides a high quality connection between peripheral devices that feature a USB 3.0 type-B port, such as hard drive enclosures, card readers, docking stations, and video capture devices and a USB-capable computer. This cable is USB-IF certified to USB 3.0 specifications, guaranteeing a dependable, long-lasting connection to your USB 'B' devices. This product is USB-IF Certified and tested for dependable connectivity and performance.